Amanda Hart started her professional career as a writer in 2011. Most of her work for various websites centers on personal training, nutritional counseling and leading nutritional seminars. She is an ACSM-certified personal trainer and has a dual bachelor's degree in exercise science and community nutrition from The Ohio State University. Braising is classic cooking method where you pan sear meat, then partially cover it in an aromatic and flavorful sauce to finish cooking it via indirect heat cooking. By only partially covering the meat, the browned outside remains crispy and texturally pleasing. Typically, the cut of meat chosen for braising is full of connective tissue that needs to be cooked slowly in liquid at a low temperature in order to be made tender. 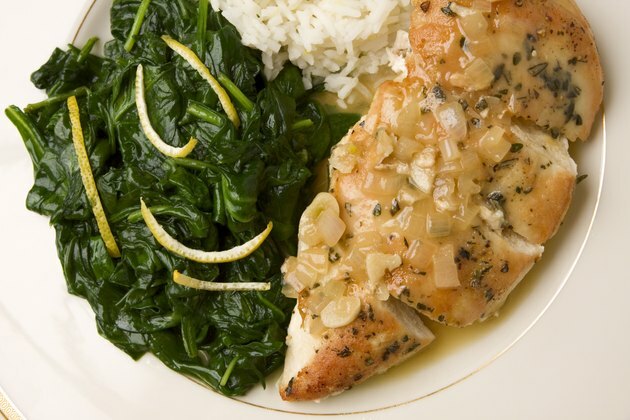 While chicken breasts don't quite fit this description, meaning that they might emerge from braising a bit dry, with the proper prep work, braising can produce a juicy, flavorful chicken breast. Heat 2 tbsp. olive oil over high heat in a skillet and preheat the oven to 325 degrees Fahrenheit. Cut the chicken breast into 2-inch chunks. Smaller cuts allow more of the sauce to penetrate each piece and reduces cooking time, which will prevent dryness. Coat the chicken pieces in the whole wheat flour and place them into the skillet once the oil is hot. Brown the chicken for about four minutes, or two minutes per side, and remove it from the pan. Deglaze the pan by adding the remaining 1 tbsp. olive oil. Once it is hot, add the onion, garlic, rosemary, salt and pepper. Cook until the onion is translucent, stirring frequently. Add the chicken pieces back to the pan along with the chicken broth. Only use enough broth to partially cover the chicken, leaving the tops exposed above the liquid. Serve the chicken with 1/2 cup brown rice per person, ladling the sauce over both the chicken and rice. If desired, substitute chicken broth for other liquids, such as wine, oil or a combination of all three. Overcooking chicken breasts results in dryness. Keep your oven temperature low and check the dish frequently. Do not cook the chicken to an internal temperature above 160 degrees Fahrenheit.